Our glass and crystal drawer and cabinet pulls will make any cabinet or furniture piece sparkle with vintage elegance. Choose a color and finish to match your cabinet's and drawers' glass knobs for a bright and updated look. A sturdy and elegant bridge pull rounds out our collection of hexagonal glass cabinet hardware. 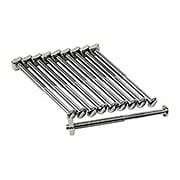 This 3" on center pull is the perfect size for all of your kitchen and bath drawers. From classic clear to ruby red, you'll find the perfect color for your home. This exquisite Hexagonal Cut-Glass Handle (4-Inch Center-to-Center) adds a distinctive touch to your cabinets or furniture. Multi-faceted and amazingly clear, it sparkles like fine European stemware. 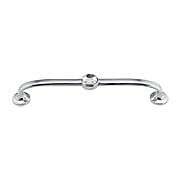 The pull is mounted on a shapely forged brass base, and comes in an array of classic finish options. 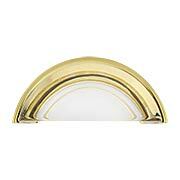 This substantial bridge pull rounds out our collection of sparkling Deco-style glass cabinet hardware. 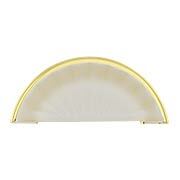 At 3" on center, it's the perfect size for all of your kitchen or bath drawers. For cabinet doors use our matching medium fluted knobs, or pair with classic nickel turn latches. Mounting glass knobs and pulls is made easier with our ferrule mounting kit. 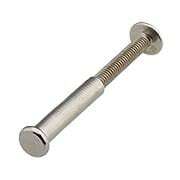 Replacing the old "nut and bolt", this modern version eliminates the protrusion of the bolt on the inside of your cabinet or drawer without changing the outside appearance of the knob. 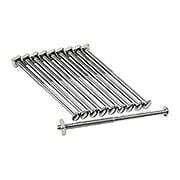 It comes complete with three screw lengths to accommodate almost any drawer or cabinet door thickness. 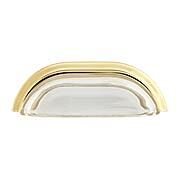 Spare and square, this distinctive glass pull is a must-have for the modern kitchen and bath. 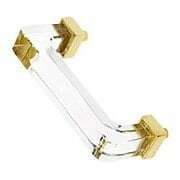 The crystal clear handle is mounted on a sturdy, forged brass base, and may be installed horizontally or vertically. Choose from 5 popular finishes! 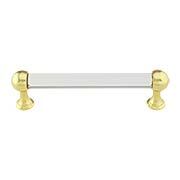 Unlacquered brass and brilliant glass make a dazzling combination in this elegant Victorian style bridge pull. The star-shaped posts are set at 2 15/16" on center, perfect for all your kitchen and bath drawers. 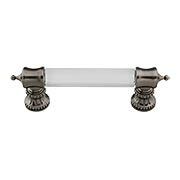 Polished nickel and brilliant clear glass make a sparkling combination in this elegant Victorian style bridge pull. The star-shaped posts are set at 2 15/16" on center, perfect for all your kitchen and bath drawers. The Spa collection adds a dash of glamour to your cabinets, furniture, or drawers. This 3" pull features your choice of two cool metal finishes paired with a reflective green glass tile. Unique and luxurious, it is at home in a variety of interior styles. The Spa collection adds a dash of glamour to your cabinets, furniture, or drawers. 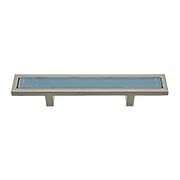 This 3" pull features your choice of two cool metal finishes paired with a reflective blue glass tile. Unique and luxurious, it is at home in a variety of interior styles. The Legacy Crystal collection adds simple luxury to your decor. 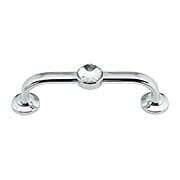 This drawer pull features a center crystal mounted on a shapely base in your choice of three classic finishes. Install this beauty anywhere in your home for a touch of sparkle. This larger pull is ideal for both cabinets and furniture. The Legacy Crystal collection adds simple luxury to your decor. 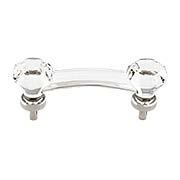 This drawer pull features a center crystal mounted on a shapely base in your choice of three classic finishes. Install this beauty anywhere in your home for a touch of sparkle. This smaller sized knob is ideal for both cabinets and furniture. The Spa collection adds a dash of glamour to your cabinets, furniture, or drawers. 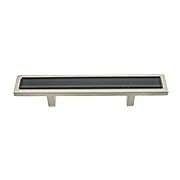 This 3" pull features your choice of two cool metal finishes paired with a reflective black glass tile. Unique and luxurious, it is at home in a variety of interior styles. A favorite for over one-hundred years, our decorative Lead-Free Crystal Handle Pull (4 3/4-Inch Center-to-Center) is an inspired choice for a variety of period homes. Beautifully made from solid forged brass and lead-free crystal, it adds a touch of class to your cabinets and drawers. Choose from a host of popular finish options. A favorite for over one-hundred years, our decorative Lead-Free Crystal Handle Pull (3 3/4-Inch Center-to-Center) is an inspired choice for a variety of period homes. 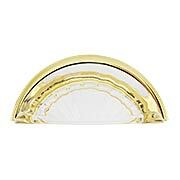 Beautifully made from solid forged brass and lead-free crystal, it adds a touch of class to your cabinets and drawers. Choose from a host of popular finish options. The classic design of our Fluted Lead-Free Crystal Cup Pull (3-Inch Center-to-Center) adds sparkle to any kitchen, bath or piece of furniture. 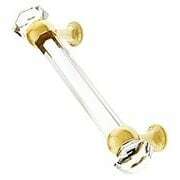 Beautifully made from solid-brass and lead-free crystal, it is available in a host of classic finish options. This half-moon design works well with Victorian, Mid-Century, modern or rustic interiors. The classic design of our Clear Lead-Free Crystal Cup Pull (3-Inch Center-to-Center) adds sparkle to any kitchen, bath or piece of furniture. 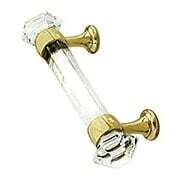 Beautifully made from solid-brass and lead-free crystal, it is available in a host of classic finish options. This half-moon design works well with Victorian, Mid-Century or even rustic interiors. Similar to antique bin pulls used in the 1900s, our Frosted Fluted Lead-Free Crystal Cup Pull (3-Inch Center-to-Center) adds old-world elegance to your home. Beautifully made from solid-brass and lead-free crystal, it is available in a host of classic finish options. This half-moon design works well with Victorian, Mid-Century or even rustic interiors. The semi-opaque crystal of our Frosted Lead-Free Crystal Cup Pull (3-Inch Center-to-Center) adds an intriguing element to any kitchen, bathroom or piece of furniture. Beautifully made from solid-brass and lead-free crystal, it is available in a host of classic finish options. This half-moon design works well with Victorian, Mid-Century or even rustic interiors. 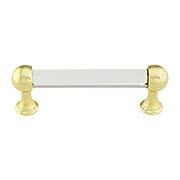 Our Chautauqua Cabinet Pull (3 3/4-Inch Center-to-Center) brings a touch of sparkle to your kitchen or bath. The lightly-textured glass handle dramatically pairs with decorative beaded posts for a distinctive look that complements a variety of interior styles. Choose from an array of popular finish options. Our sparkling Octagonal Clear-Glass Bridge Drawer Pull (3-Inch Center-to-Center) adds understated elegance to any kitchen or bath. This classic, turn-of-the-century style is ideal for cabinet doors, drawers, and furniture. Its solid-brass bases come in a host of traditional finish options. 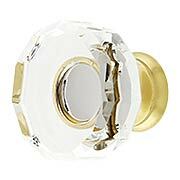 Our Lowell Cabinet Knob (1 3/8-Inch Diameter) brings an elegant to any room. 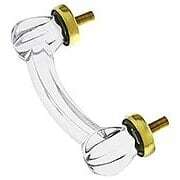 Made of dazzling, clear crystal glass with a solid-brass base, it comes in a host of popular finishes. Bright, fresh and full of sparkle, it is sure to be the focal point of your kitchen or bath. The classic design of our Clear-Glass Cup Pull (4-Inch Center-to-Center) adds traditional style to any kitchen, bath or piece of furniture. Beautifully made from solid-brass and thick glass, it is available in a host of finish options. This half-moon design works well with Victorian, Mid-Century or even rustic interiors.